BBC Radio 4's Law in Action ran a piece this week on cyclists and the law. It had me shouting at Joshua Rozenberg's lazily opinionated anti-cyclist ramble (cyclists all think the law doesn't apply to them, cycling is dangerous etc) and MP Andrea Leadsom's aims to bring in a new offence of causing death by dangerous cycling. Thanks to the BBC's Shout Again facility, you can hear it for the next few days - the relevant bit starts at 21:00. Rozenberg referred to the infamous 2007 Rhiannon Bennett case, where the unfortunate teenager was knocked down and killed by a 'speeding' cyclist . Just like the tabloids' frothing reports of the incident, he didn't mention that the young woman had been drinking, or that the collision may have actually taken place on the road, or that 'speeding' meant '17mph'. The reactions of Bennett's parents are understandable. As are those of the relatives of Eilidh Cairns, the experienced and confident London cyclist killed by an HGV driver with defective eyesight. The man responsible, Joao Lopes, was fined £200 and got three points on his licence. He continued driving, and is now being questioned by the police in connection with the death of a pedestrian in Marylebone Road in June. Compare that to the punishment received by Bennett's killer, who was fined £2,200, and it's hard to see how - as Rozenberg's glib introduction to the radio piece suggests - cyclists are 'getting an easy ride' from the law. The whole question of pavement cycling is trickier than it looks, as law'n'cycling blogger Joren Knibbe explains. He's the one rolled out in the programme as 'representing the cyclist', but it's all a bit clunky - it seems the programme makers, and Rozenberg, don't really have much idea what point they're making. Neither do I. Overall, a poor effort from the Law in Action team. Still, don't take my word for it. Listen and decide for yourself what to yell at your iPlayer. PS The BBC reports today that a lorry driver doing 55mph in a 40mph limit and using a phone was cleared of causing death by dangerous driving after he mowed down a cyclist on the A40 last year. PS 2 I've just found Joren's UKCycleRules blog post about how the programme turned out from his point of view. Not overjoyed, I think it's fair to say. This is why we needed you back, Rob. I didn't know the details of the Rhiannon case but if I had, I would have taken that part of the programme a good deal less quietly than I did. As for the lorry driver, I'd best not start. Your comparison of the Bennett case with a run down cyclist fails because the car driver is following the law as s-he drives on the road while the cyclist who hit Bennett was unlawful for being on the pavement. So, the whole question rests upon the legality of cycling on the pavement. Common sense and logic don't count. The only thing that counts is if you are following the rules or not, may they be just or unjust or just stupid. I think it is high time to reconsider the unlawfulness of cycles on the pavement. 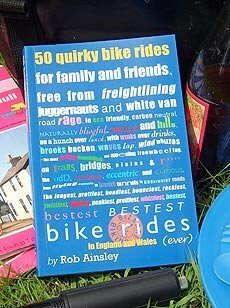 A cycle is a small device that doesn't compare to a car and even less to a bus or a lorry. If you ride on the pavement being careful you are not endangering anyone. There is a very simple rule that can be applied to cyclists on the pavement, which is the rule of priority. 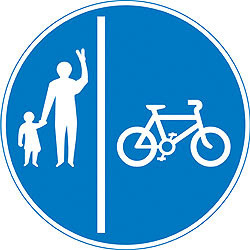 The same way you have to stop on some crossings and give priority to vehicles coming on the other road, if you are cycling on the pavement you know that pedestrians have priority. Ok, accidents happen and negligence too, but as you point in your post, justice has been harsher on cyclists than on drivers. In most countries you can cycle on the pavement and this is not killing people all over. 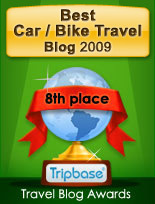 After all, the question really is based on the classification of a bike as a vehicle. So, what about roller skates, are they vehicles too? Both, cyclist and pedestrians are just human beings and there is no reason to put cyclists in danger to allegedly protect pedestrians. If the cyclist killed in London last Friday, 10th November 2011, had been on the pavement she would be alive now. Definitely, the rules must be rethought. As I mention in the post, though the cyclist is routinely referred to in lazy newspapers as 'speeding' on the 'pavement', at least one police officer in court said the collision took place *on the road*. That said, I'll admit, it's not a like-for-like legal comparison. I was just trying to point out that a general audience would *automatically* side against the cyclist in either case, even though the other circumstances were fairly similar. I see in other recent news that a woman was heavily fined for cycling along Weymouth promenade, with no suggestion that she was endangering anyone. I'm not defending her behaviour - she had been warned once already - but her treatment does seem harsh, compared to how many motorists would defend their driving at 80mph on a deserted motorway.